Central to the compassionate care we provide, St Luke’s nurses are precious. Sponsoring them makes a real difference to patients’ lives, but did you know this invaluable support comes from businesses and other organisations as well as from individuals? 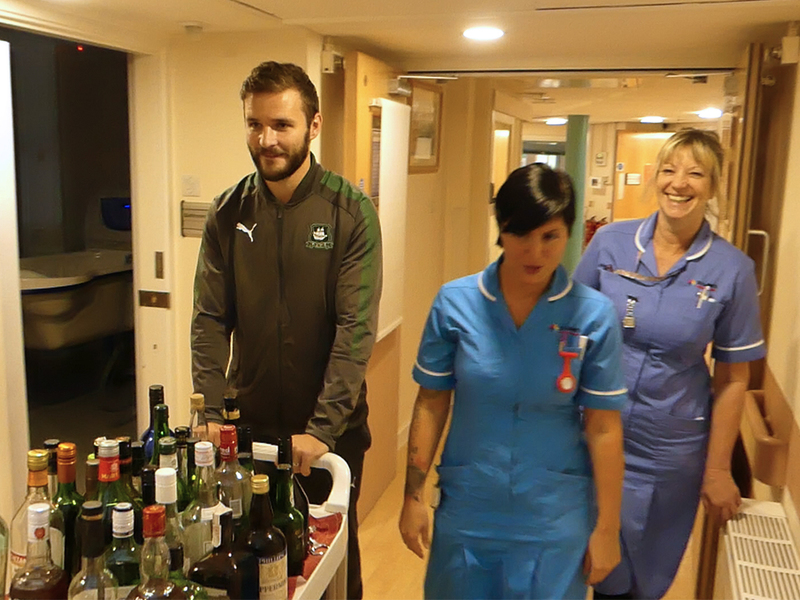 Plymouth Argyle Football Club has put its best foot forward to provide sponsorship for just this cause, and sent some of its players to the specialist unit recently to see for themselves the outstanding care provided by our team. During their visit, the football players met the nurses and had a tour around the building. They also heard how staff work with patients and families to create lasting positive memories. “It’s a truly amazing place, there is no detail that goes uncovered” said one of the team. “One thing that really stands out is the amount of care that goes into this place. “My expectation was that it might be kind of morbid but in actual fact it could not be further from that, I think it’s inspirational, not just what the nurses do, but also the doctors and volunteers. One volunteer told me that if she ever needed this sort of assistance she would have no qualms about coming here. That says a lot about the place it really is a brilliant job that they do here, the care that goes into the patients is completely evident. For young people it’s so easy to turn a blind eye to things like this, being poorly isn’t something that you would like to think about. But there is so much good work that goes on here and if ever we had loved ones coming here, they would certainly see for themselves what a good positive place this is. This is a place that you must see for yourself to really appreciate how much good work goes on. If anyone had any misconception about St Luke’s, then coming here would let them see how amazing it is. Interested in joining the Sponsor a Nurse program, or want to know more about the work of our nurses? Visit our sponsor a nurse page here.